The bearing internal clearance is the relative movement of the outer and inner rings when they are lightly pushing in opposite directions. Movement in the diametrical direction is radial clearance, while movement in the shaft’s direction is axial clearance. Internal clearance is critical to bearing performance for multiple reasons. 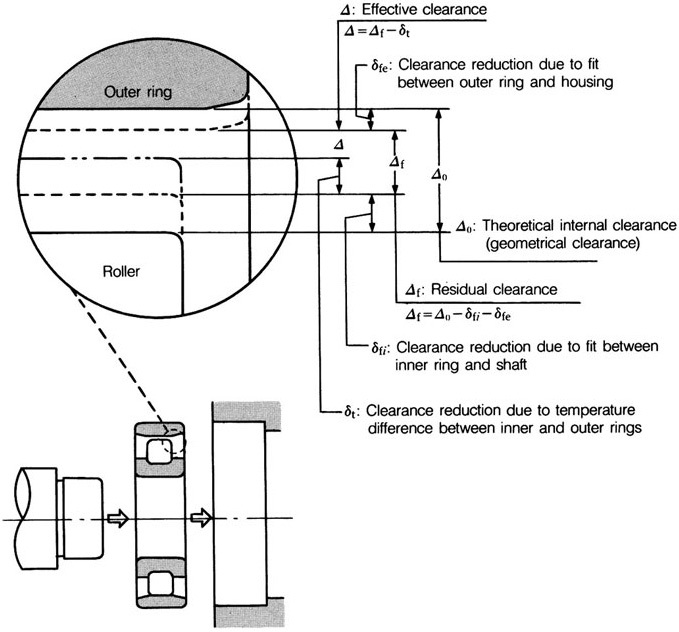 The amount of clearance influences the load distribution in a bearing, which ultimately affects its life. It also influences bearing running noise and vibration. In addition, it can influence whether the rolling elements move by rolling or sliding motion. Normally, bearings are installed with an interference fit for either the inner or outer ring. This leads to expansion (inner ring) or contraction (outer ring), which causes a change in the internal clearance of the bearing after the assembly process. When the unit is running, the bearing's generic operating temperature may increase until it reaches a saturation temperature where the heat generation and heat rejection of the system are balanced. While we typically use this generic operating temperature for the entire bearing, the actual temperature of the inner ring, outer ring and rolling elements may vary significantly. This temperature difference can cause changes in the internal clearance as shown in Image 1. In addition, when a bearing operates under load, an elastic deformation of the inner ring, outer ring and rolling elements also leads to a change in clearance. Quantifying all of these changes can make calculating bearing internal clearance a complex task. Following are definitions of types of clearances. This is the internal clearance measured under a specified measuring load, and can be called “apparent clearance.” This clearance includes the elastic deformation (бFO) caused by the measuring load. This is radial internal clearance, which is the measured clearance minus the elastic deformation caused by the measuring load. This is the bearing clearance that exists in a machine at its operating temperature, excluding the elastic deformation caused by load. This is the clearance when considering only the changes due to bearing fitting бf and temperature difference between the inner and outer rings бt. The basic load ratings of bearings apply only when the effective clearance ∆=0. This is the actual clearance when a bearing is installed and running under load. Here, the effect of elastic deformation бF is included along with fitting and temperature. Generally, the operating clearance is not used in the calculation. The most important bearing clearance is the effective clearance. Theoretically, a bearing with a slightly negative effective clearance ∆ will have the longest life. A slightly negative clearance (or preload) will become positive under the influence of bearing load. However, it is impossible to make the clearance of all bearings reach the ideal effective clearance, and one must consider the geometrical clearance ∆0 in order to achieve a zero or slightly negative effective clearance minimum value. To calculate this value, one needs to know both the clearance reduction caused by the interference of the inner ring and outer ring Df and clearance change caused by the temperature difference between inner ring and outer ring Dt. When the inner ring of a bearing is press fit onto a shaft, or when the outer ring is press fit into a housing, the radial internal clearance will naturally decrease due to the resulting expansion or contraction of the bearing raceways. Generally, most pumps have a rotating shaft that requires a tight fit between the inner ring and shaft and a loose fit between the outer ring and housing. In these cases, only the effect of the interference on the inner ring needs to be considered. An example calculation is shown in Equation 1 for a 6310 single row deep groove ball bearing. The shaft tolerance used is K5, while the housing is H7. The interference fit is applied only to the inner ring. Shaft diameter, bore size and radial clearance are the standard bearing measurements. 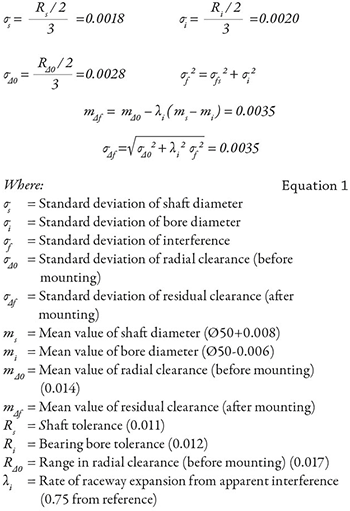 Assuming that 99.7 percent of the parts are within tolerance, the mean value (m∆f) and standard deviation (σ∆f) of the internal clearance after mounting (residual clearance) can be calculated. Measurements are given in units of millimeters (mm).